I had a very bookish start to the week this week, and as far as I am concerned a bookish week is a good week! Last Sunday I talked my sister and her husband into going out into the city. It was a gorgeous day weather wise when we caught the train into the city. 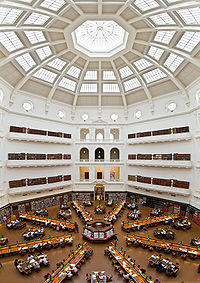 Our destination was the State Library of Victoria, and in particular the Look:! 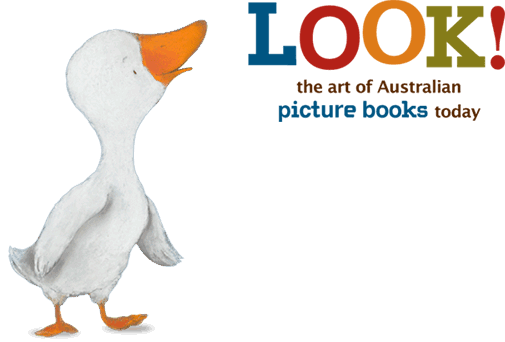 The Art of Australian Picture Books today exhibition which is on display until 29 May 2011. My main reason for wanting to go was to be able to go and see a couple of examples of Shaun Tan's art from both The Arrival (have I mentioned lately how much I love that book?) and The Rabbits which was written by John Marsden who also wrote the Tomorrow, When the War Began series. I certainly wasn't disappointed by those pieces of art. The fact that The Arrival has so many images in the book, and yet is completely drawn in pencil astonishes me still three or four years after I first read the book. Really though the target audience for the exhibition is slightly younger than me so luckily we had my 3 year old nephew and 12 year old son with us! It's always interesting to see what it is that catches the attention of a toddler. My nephew and his dad had put their tent up in the backyard on Saturday night and slept in there. There was one illustration (and this is where I wish I had of kept the list of titles of all the books featured in the display) which featured a family going camping, and he was interested, but the main thing he said was that the tent should be blue, which is the colour that their tent is. After looking at a lot of the different illustrations, it was storytime and my nephew listened to two stories, one that was something about a pig, and the other was Mr Chicken goes to Paris by Leigh Hobbs. I thought that this was such a fun picture book. 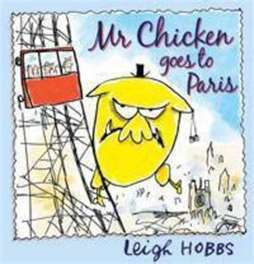 Mr Chicken is a 4 metre tall bright yellow chicken who goes on a plane to Paris and takes in all the sights! Such fun, especially if you take the time to notice all the background details! One thing that I thoroughly enjoyed was seeing all the different mediums that illustrators were using. There were waterpaint drawings, collage, paper sculptures, native inspired art and so much more. After visiting the display, we took the opportunity to visit the reading room and the fantastic dome that forms such an impressive part of the architecture at the State Library of Victoria. There are other exhibitions in the galleries which surround the dome. I had seen them before but it is always nice to go and look at books that are hundreds of years old. I was talking to one of the staff about how much a couple of the books are worth. One book alone is worth $12 million (cue jokes about reading that book on the trains!). Follow that up with a chocolate frappe fix and it was a good afternoon all round. I was planning on talking about my other State Library related event in this post, but I think this is probably long enough so I will do a separate post for that one. Look! Sounds like a beautiful exhibit. And all the better for some Shaun Tan lovin'. It sounds like it was a wonderful day at a great exhibition, and I am glad that you all had such a nice time! This sounds like a lovely exhibition. I loved it when my kids were young and I could indulge in picture books. Of course, I could still except that there are so many books and one moves on. I'll have to wait for grandchildren now I reckon. Love the reading room. Must get their on my next trip. Weekend Cooking: A mid-life passion? Sydney Book Blogger meet up!